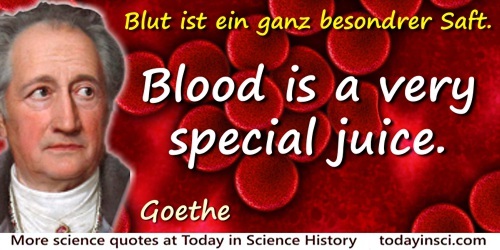 German poet, zoologist, botanist and geologist who an intellectual with an interest writing on science, but was primarily famous for poetry and literature. Alles Gescheite ist schon gedacht worden; man muss nur versuchen, es noch einmal zu denken. Everything that is worth thinking has already been thought; one must only try to think it again. As translated in William Francis Henry King (ed. ), Classical and Foreign Quotations: A Polyglot Manual of Historical (1904), 234. Blut ist ein ganz besondrer Saft. Blood is a very special juice. The history of the sciences is a great fugue, in which the voices of the nations come one by one into notice. In James Wood, Dictionary of Quotations from Ancient and Modern, English and Foreign Sources (1893), 64:23. Die Mathematiker sind eine Art Franzosen. Spricht man zu ihnen, so übersetzen sie alles in ihre eigene Sprache, und so wird es alsobald etwas ganz anderes. Mathematicians are a kind of Frenchmen. Whenever you say anything or talk to them, they translate it into their own language, and right away it is something completely different. Quoted by Christiane Senn-Fennell, 'Oral and Written Communication', in Ian Westbury et al. (eds. ), Teaching as a Reflective Practice (2000), 225. Title of a novel, 1809. Geduld will bei dem Werke sein. Not Art and Science serve alone; Patience must in the work be shown. Lines for character Mephistopheles in Faust I. As translated by Bayard Taylor in Lilian Dalbiac, Dictionary of Quotations (German) (1909, 256. Also translated as “Not art and science only, but patience will be required for the work”, in James Wood, Dictionary of Quotations from Ancient and Modern, English and Foreign Sources (1893), 298, No. 11. He who is ignorant of foreign languages knows not his own. Wer kann was Dummes, wer was Kluges denken, Das nicht die Vorwelt schon gedacht? What is there, wise or foolish, one can think, That former ages have not thought before? Words of Mephistopheles written in Faust, Pt. 2, Act 2. As quoted and translated by the editor in in William Francis Henry King (ed. ), Classical and Foreign Quotations: A Polyglot Manual of Historical (1904), 234. 'Gedichte' in Goethes Werke (1948, 1952), Vol. 1, 367. Cited in Max Jammer, Einstein and Religion (2002), 79. Wilst du ins Unendliche schreiten, Geh nur im Endlichen nach allen Seiten. If you want to reach the infinite, explore every aspect of the finite. Jeremy Naydler (ed. ), Goethe On Science: An Anthology of Goethe’s Scientific Writings (1996), 37. Zweck sein selbst ist jegliches Tier. Each animal is an end in itself. 'Metamorphose der Tiere' (1806), in David Luke (ed. ), Goethe (1964), 152. A man avails himself of the truth so long as it is serviceable; but he seizes on what is false with a passionate eloquence as soon as he can make a momentary use of it; whether it be to dazzle others with it as a kind of half-truth, or to employ it as a stopgap for effecting all apparent union between things that have been disjointed. In The Maxims and Reflections of Goethe (1906), 193. A man cannot well stand by himself, and so he is glad to join a party; because if he does not find rest there, he at any rate finds quiet and safety. In The Maxims and Reflections of Goethe (1906), 183. A man must cling to the belief that the incomprehensible is comprehensible; otherwise he would not try to fathom it. In The Maxims and Reflections of Goethe (1906), 194. A man’s errors are what make him amiable. As quoted in Adam Wooléver (ed. ), A Treasury of Wisdom, Wit and Humor, Odd Comparisons and Proverbs (1876), 128. The quote is identified as from last number of his Journal of Art in his 77th year, in François duc de La Rochefoucauld, Moral Reflections, Sentences and Maxims (1851), 70, footnote. In Wilhelm Meister, Wanderjahre, Zweites Buch, in 'Sprüche in Prosa' Natur, VI, 947. All is born of water; all is sustained by water. An important fact, an ingenious aperçu, occupies a very great number of men, at first only to make acquaintance with it; then to understand it; and afterwards to work it out and carry it further. In The Maxims and Reflections of Goethe (1906), 189. An old foundation is worthy of all respect, but it must not take from us the right to build afresh wherever we will. In The Maxims and Reflections of Goethe (1906), 188. And in acting thus he remains equally at ease whether the majority agree with him or he finds himself in a minority. For he has done what he could: he has expressed his convictions; and he is not master of the minds or hearts of others. In The Maxims and Reflections of Goethe (1906), 190. As for what I have done as a poet, I take no pride in whatever. Excellent poets have lived at the same time with me, poets more excellent lived before me, and others will come after me. But that in my country I am the only person who knows the truth in the difficult science of colors—of that, I say, I am not a little proud, and here have a consciousness of superiority to many. Wed 18 Feb 1829. Johann Peter Eckermann, Conversations with Goethe, ed. J. K. Moorhead and trans. J. Oxenford, (1971), 302. As soon as any one belongs to a narrow creed in science, every unprejudiced and true perception is gone. Conversation (18 May 1824), with Johann Peter Eckermanns, in Conversations with Goethe (1850), 170. Authority. Man cannot exist without it, and yet it brings in its train just as much of error as of truth. It perpetuates one by one things which should pass away one by one; it rejects that which should be preserved and allows it to pass away; and it is chiefly to blame for mankind’s want of progress. Authority—the fact, namely, that something has already happened or been said or decided, is of great value; but it is only a pedant who demands authority for everything. Every instant she commences an immense journey, and every instant she has reached her goal. As quoted by T.H. Huxley, in Norman Lockyer (ed. ), 'Nature: Aphorisms by Goethe', Nature (1870), 1, 10. Every investigator must before all things look upon himself as one who is summoned to serve on a jury. He has only to consider how far the statement of the case is complete and clearly set forth by the evidence. Then he draws his conclusion and gives his vote, whether it be that his opinion coincides with that of the foreman or not. Every situation, every moment—is of infinite worth; for it is the representative of a whole eternity. Everything that comes into being seeks room for itself and desires duration: hence it drives something else from its place and shortens its duration. In The Maxims and Reflections of Goethe (1906), 199. Everything that we call Invention or Discovery in the higher sense of the word is the serious exercise and activity of an original feeling for truth, which, after a long course of silent cultivation, suddenly flashes out into fruitful knowledge. First let a man teach himself, and then he will be taught by others. In The Maxims and Reflections of Goethe (1906), 184. For they are, in truth, textbooks of life: they gather outer and inner experiences into a general and connected whole. He who posseses science and art, has religion; he who possesses neither science nor art, let him get religion. Quoted in Miguel De Unamuno, Tragic Sense of Life (1913), translated by John Ernest Crawford Flitch (1954), 210. Here I am at the limit which God and nature has assigned to my individuality. I am compelled to depend upon word, language and image in the most precise sense, and am wholly unable to operate in any manner whatever with symbols and numbers which are easily intelligible to the most highly gifted minds. In Letter to Naumann (1826), in Vogel, Goethe's Selbstzeugnisse (1903), 56. Hypotheses are cradle-songs by which the teacher lulls his scholars to sleep. The thoughtful and honest observer is always learning more and more of his limitations; he sees that the further knowledge spreads, the more numerous are the problems that make their appearance. In The Maxims and Reflections of Goethe (1906), 195. Hypotheses are the scaffolds which are erected in front of a building and removed when the building is completed. They are indispensable to the worker; but the worker must not mistake the scaffolding for the building. In Maxims and Reflections (1893), as quoted in Philipp Frank, Modern Science and its Philosophy (1949), 62. I could never have known so well how paltry men are, and how little they care for really high aims, if I had not tested them by my scientific researches. Thus I saw that most men only care for science so far as they get a living by it, and that they worship even error when it affords them a subsistence. Wed 12 Oct 1825. Johann Peter Eckermann, Conversations with Goethe, ed. J. K. Moorhead and trans. J. Oxenford (1971), 119-20. I had rather be Mercury, the smallest among seven [planets], revolving round the sun, than the first among five [moons] revolving round Saturn. In James Wood, Dictionary of Quotations from Ancient and Modern, English and Foreign Sources (1893), 166:23. If a man devotes himself to the promotion of science, he is firstly opposed, and then he is informed that his ground is already occupied. At first men will allow no value to what we tell them, and then they behave as if they knew it all themselves. If many a man did not feel obliged to repeat what is untrue, because he has said it once, the world would have been quite different. In The Maxims and Reflections of Goethe (1906), 196. If two masters of the same art differ in their statement of it, in all likelihood the insoluble problem lies midway between them. In The Maxims and Reflections of Goethe (1906), 186. If we look at the problems raised by Aristotle, we are astonished at his gift of observation. What wonderful eyes the Greeks had for many things! Only they committed the mistake of being overhasty, of passing straightway from the phenomenon to the explanation of it, and thereby produced certain theories that are quite inadequate. But this is the mistake of all times, and still made in our own day. Ignorant people raise questions which were answered by the wise thousands of years ago. In The Maxims and Reflections of Goethe (1906), 187. In all our academies we attempt far too much. ... In earlier times lectures were delivered upon chemistry and botany as branches of medicine, and the medical student learned enough of them. Now, however, chemistry and botany are become sciences of themselves, incapable of comprehension by a hasty survey, and each demanding the study of a whole life, yet we expect the medical student to understand them. He who is prudent, accordingly declines all distracting claims upon his time, and limits himself to a single branch and becomes expert in one thing. Quoted in Johann Hermann Baas, Henry Ebenezer Handerson (trans. ), Outlines of the History of Medicine and the Medical Profession (1889), 842-843. In all times it is only individuals that have advanced science, not the age. In James Wood, Dictionary of Quotations from Ancient and Modern, English and Foreign Sources (1893), 184:42. In Nature we never see anything isolated, but everything in connection with something else which is before it, beside it, under it, and over it. In James Wood, Dictionary of Quotations from Ancient and Modern, English and Foreign Sources (1893), 183:24. In science it is a service of the highest merit to seek out those fragmentary truths attained by the ancients, and to develop them further. In The Maxims and Reflections of Goethe (1906), 198. In the history of science and throughout the whole course of its progress we see certain epochs following one another more or less rapidly. Some important view is expressed, it may be original or only revived; sooner or later it receives recognition; fellow-Workers spring up; the outcome of it finds its way into the schools; it is taught and handed down; and we observe, unhappily, that it does not in the least matter whether the view be true or false. In either case its course is the same; in either case it comes in the end to he a mere phrase, a lifeless word stamped on the memory. In the sphere of natural science let us remember that we have always to deal with an insoluble problem. Let us prove keen and honest in attending to anything which is in any way brought to our notice, most of all when it does not fit in with our previous ideas. For it is only thereby that we perceive the problem, which does indeed lie in nature, but still more in man. In the world of science, however, these sentiments have never been of much account. There everything depends on making opinion prevail and dominate; few men are really independent; the majority draws the individual after it. In The Maxims and Reflections of Goethe (1906), 191. Incompetency is a greater obstacle to perfection than one would think. In The Maxims and Reflections of Goethe (1906), 201. It has been said that numbers rule the world; but I know that the numbers teach us, whether it is governed well or badly. It is a misfortune to pass at once from observation to conclusion, and to regard both as of equal value; but it befalls many a student. It is always, our eyes alone, our way of looking at things. Nature alone knows what she means now, and what she had meant in the past. In The Maxims and Reflections of Goethe (1906), 203. It is difficult to know how to treat the errors of the age. If a man oppose them, he stands alone; if he surrender to them, they bring him neither joy nor credit. In The Maxims and Reflections of Goethe (1906), 185. It seems to me that every phenomenon, every fact, itself is the really interesting object. Whoever explains it, or connects it with other events, usually only amuses himself or makes sport of us, as, for instance, the naturalist or historian. But a single action or event is interesting, not because it is explainable, but because it is true. Quoted in translated from Unterhaltungen deutscher Ausgewanderten in Franz Boas, 'The Study of Geography', Science Supplement (11 Feb 1881), 9, No. 210, 139. It will be! the mass is working clearer! As spoken by character Wagner, in Johann Goethe and Bayard Taylr (trans. ), Faust: A tragedy by Johann Wolfgang von Goethe, translated, in the original metres: The Second Part (1871), Act 2, Scene 2, Laboratory, 119. Just as it will never be successfully challenged that the French language, progressively developing and growing more perfect day by day, has the better claim to serve as a developed court and world language, so no one will venture to estimate lightly the debt which the world owes to mathematicians, in that they treat in their own language matters of the utmost importance, and govern, determine and decide whatever is subject, using the word in the highest sense, to number and measurement. In 'Sprüche in Prosa', Natur, III, 868. Let us seek to fathom those things that are fathomable and reserve those things which are unfathomable for reverence in quietude. Man is born, not to solve the problems of the universe, but to find out where the problem applies, and then to restrain himself within the limits of the comprehensible. Wed. 12 Oct 1825. Johann Peter Eckermann, Conversations with Goethe, ed. J. K. Moorhead and trans. J. Oxenford (1971), 120. Man is not born to solve the problem of the universe, but to find out where the problem begins and then restrain himself within the limits of the comprehensible. The Homiletic Review, Vol. 83-84 (1922), Vol. 84, 290. Mathematicians are like a certain type of Frenchman: when you talk to them they translate it into their own language, and then it soon turns into something completely different. Maxims and Reflections (1998), trans. E. Stopp, 162. Mathematicians are like Frenchmen: whatever you say to them they translate into their own language and forthwith it is something entirely different. Mathematics can remove no prejudices and soften no obduracy. It has no influence in sweetening the bitter strife of parties, and in the moral world generally its action is perfectly null. In James Wood, Dictionary of Quotations from Ancient and Modern, English and Foreign Sources (1893), 271:3. Mathematics has the completely false reputation of yielding infallible conclusions. Its infallibility is nothing but identity. Two times two is not four, but it is just two times two, and that is what we call four for short. But four is nothing new at all. And thus it goes on and on in its conclusions, except that in the higher formulas the identity fades out of sight. As quoted in Richard von Mises, 'Mathematical Postulates and Human Understanding', collected in J.R. Newman (ed.) The World of Mathematics (1956), Vol. 3, 1754. Mathematics, like dialectics, is an organ of the inner higher sense; in its execution it is an art like eloquence. Both alike care nothing for the content, to both nothing is of value but the form. It is immaterial to mathematics whether it computes pennies or guineas, to rhetoric whether it defends truth or error. Nature does not suffer her veil to be taken from her, and what she does not choose to reveal to the spirit, thou wilt not wrest from her by levers and screws. In James Wood, Dictionary of Quotations from Ancient and Modern, English and Foreign Sources (1893), 119:29. Nature goes her own way, and all that to us seems an exception is really according to order. Thurs 9 Dec 1824. Johann Peter Eckermann, Conversations with Goethe, ed. J. K. Moorhead and trans. J. Oxenford (1971), 75. Nature is beneficent. I praise her and all her works. She is silent and wise. … She is cunning, but for good ends. … She has brought me here and will also lead me away. I trust her. She may scold me, but she will not hate her work. Nature! … Each of her works has an essence of its own; each of her phenomena a special characterisation: and yet their diversity is in unity. Nature! … Incessant life, development, and movement are in her, but she advances not. She changes for ever and ever, and rests not a moment. Quietude is inconceivable to her, and she has laid her curse upon rest. She is firm. Her steps are measured, her exceptions rare, her laws unchangeable. As quoted by T.H. Huxley, in Norman Lockyer (ed. 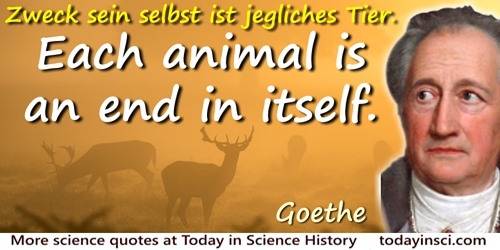 ), 'Nature: Aphorisms by Goethe', Nature (1870), 1, 9. Nature! … She creates needs because she loves action. Wondrous! that she produces all this action so easily. Every need is a benefit, swiftly satisfied, swiftly renewed.—Every fresh want is a new source of pleasure, but she soon reaches an equilibrium. Nature! … She is always building up and destroying; but her workshop is inaccessible. Nature! … She is ever shaping new forms: what is, has never yet been; what has been, comes not again. Everything is new, and yet nought but the old. Nature! … She is the only artist; working-up the most uniform material into utter opposites; arriving, without a trace of effort, at perfection, at the most exact precision, though always veiled under a certain softness. Nature! … She performs a play; we know not whether she sees it herself, and yet she acts for us, the lookers-on. Nature! … She tosses her creatures out of nothingness, and tells them not whence they came, nor whither they go. It is their business to run, she knows the road. Nature! … The one thing she seems to aim at is Individuality; yet she cares nothing for individuals. Nature! … The spectacle of Nature is always new, for she is always renewing the spectators. Life is her most exquisite invention; and death is her expert contrivance to get plenty of life. Nature! … We live in her midst and know her not. She is incessantly speaking to us, but betrays not her secret. We constantly act upon her, and yet have no power over her. Nature! … We obey her laws even when we rebel against them; we work with her even when we desire to work against her. No catastrophe has ever yielded so much pleasure to the rest of humanity as that which buried Pompeii and Herculaneum. No one can take from us the joy of the first becoming aware of something, the so-called discovery. But if we also demand the honor, it can be utterly spoiled for us, for we are usually not the first. What does discovery mean, and who can say that he has discovered this or that? After all it’s pure idiocy to brag about priority; for it’s simply unconscious conceit, not to admit frankly that one is a plagiarist. Epigraph to Lancelot Law Whyte, The Unconscious before Freud (1960). Nothing is more consonant with Nature than that she puts into operation in the smallest detail that which she intends as a whole. Jeremy Naydler (ed. ), Goethe On Science: An Anthology of Goethe’s Scientific Writings (1996), 59. Nowhere would anyone grant that science and poetry can be united. They forgot that science arose from poetry, and did not see that when times change the two can meet again on a higher level as friends. On Morphology (Zur Morphologie) (1817). Quoted in Goethe’s Botanical Writings (1952), 171-172. On the appearance of anything new the mass of people ask: What is the use of it? And they are not wrong. For it is only through the use of anything that they can perceive its value. Only he who finds empiricism irksome is driven to method. Maxims and Reflections (1998), trans. E. Stopp, 154. Our advice is that every man should remain in the path he has struck out for himself, and refuse to be overawed by authority, hampered by prevalent opinion, or carried away by fashion. In The Maxims and Reflections of Goethe (1906), 188-189. Our mistake is that we doubt what is certain and want to establish what is uncertain. My maxim in the study of Nature is this: hold fast what is certain and keep a watch on what is uncertain. Progress has not followed a straight ascending line, but a spiral with rhythms of progress and retrogression, of evolution and dissolution. As given, without citation, in Kate Louise Roberts (ed. ), Hoyt’s New Cyclopedia of Practical Quotations (1922), 635. Science and art belong to the whole world, and the barriers of nationality vanish before them. Wissenschaft und Kunst gehoren der Welt an, und vor ihhen verschwinden die Schranken der Nationalitat. From 'In a Conversation With a German Historian' (1813), in Kate Louise Roberts (ed. ), Hoyt’s New Cyclopedia of Practical Quotations (1922), 691. Science has been seriously retarded by the study of what is not worth knowing and of what is not knowable. Attributed. In James Wood, Dictionary of Quotations from Ancient and Modern, English and Foreign Sources (1893), 382:30. Science helps us before all things in this, that it somewhat lightens the feeling of wonder with which Nature fills us; then, however, as life becomes more and more complex, it creates new facilities for the avoidance of what would do us harm and the promotion of what will do us good. Since men are really interested in nothing but their own opinions, every one who puts forward an opinion looks about him right and left for means of strengthening himself and others in it. Someday someone will write a pathology of experimental physics and bring to light all those swindles which subvert our reason, beguile our judgement and, what is worse, stand in the way of any practical progress. The phenomena must be freed once and for all from their grim torture chamber of empiricism, mechanism, and dogmatism; they must be brought before the jury of man's common sense. Jeremy Naydler (ed. 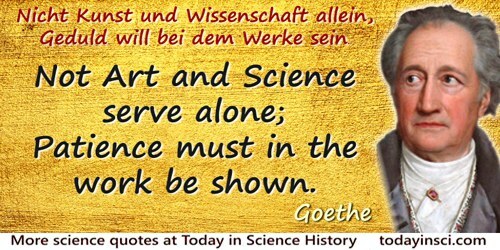 ), Goethe On Science: An Anthology of Goethe's Scientific Writings (1996), 31. The beautiful is a manifestation of secret laws of nature, which but for this phenomenon would have remained hidden from us for ever. Quoted in The Life of Goethe (1905), 101, citing Sprüche in Prosa, No. 197. The credit of advancing science has always been due to individuals, never to the age. In James Wood, Dictionary of Quotations from Ancient and Modern, English and Foreign Sources (1893), 422:12. The discerning man who acknowledges his limitations is not far off perfection. In The Maxims and Reflections of Goethe (1906), 200. The first and last thing demanded of Genius is love of truth. In George Henry Lewes, Life of J.W. von Goethe (1902), 75. The mathematician is perfect only in so far as he is a perfect being, in so far as he perceives the beauty of truth; only then will his work be thorough, transparent, comprehensive, pure, clear, attractive and even elegant. All this is necessary to resemble Lagrange. In Wilhelm Meister, Wanderjahre, Zweites Buch, in 'Sprüche in Prosa' Natur, VI, 950. The orbits of certainties touch one another; but in the interstices there is room enough for error to go forth and prevail. The Primal Plant is going be the strangest creature in the world, which Nature herself must envy me. With this model and the key to it, it will be possible to go on for ever inventing plants and know that their existence is logical; that is to say, if they do not actually exist, they could, for they are not the shadowy phantoms of a vain imagination, but possess an inner necessity and truth. The same law will be applicable to all other living organisms. To Herder, 17 May 1787. Italian Journey (1816-17), trans. W. H. Auden and Elizabeth Mayer (1970), 310-11. The supreme achievement would be to see that stating a fact is starting a theory. The thinker makes a great mistake when he asks after cause and effect. They both together make up the invisible phenomenon. The truly wise ask what the thing is in itself and in relation to other things, and do not trouble themselves about the use of it,—in other words, about the way in which it may be applied to the necessities of existence and what is already known. This will soon be discovered by minds of a very different order—minds that feel the joy of living, and are keen, adroit, and practical. The various branches of knowledge always tend as a whole to stray away from life, and return thither only by a roundabout way. The works of Lavoisier and his associates operated upon many of us at that time like the Sun's rising after a night of moonshine: but Chemistry is now betrothed to the Mathematics, and is in consequence grown somewhat shy of her former admirers. In Luke Howard, Johann Wolfgang von Goethe and D.F.S. Scott (ed. ), Luke Howard (1772-1864): His Correspondence with Goethe and his Continental Journey of 1816(1976), 2. There are two things of which a man cannot be careful enough: of obstinacy if he confines himself to his own line of thought; of incompetency, if he goes beyond it. There is much that is true which does not admit of being calculated; just as there are a great many things that cannot be brought to the test of a decisive experiment. There is no patriotic art and no patriotic science. In James Wood, Dictionary of Quotations from Ancient and Modern, English and Foreign Sources (1893), 473:44. There is no permanence in doubt; it incites the mind to closer inquiry and experiment, from which, if rightly managed, certainty proceeds, and in this alone can man find thorough satisfaction. In James Wood, Dictionary of Quotations from Ancient and Modern, English and Foreign Sources (1893), 474:2. There is nothing more frightful than ignorance in action. There is nothing more odious than the majority; it consists of a few powerful men to lead the way; of accommodating rascals and submissive weaklings; and of a mass of men who trot after them, without in the least knowing their own mind. In The Maxims and Reflections of Goethe (1906), 197. This also explains how it is that truths which have been recognised are at first tacitly admitted, and then gradually spread, so that the very thing which was obstinately denied appears at last as something quite natural. To a new truth there is nothing more hurtful than an old error. In The Maxims and Reflections of Goethe (1906), 192. To err is to be as though truth did not exist. To lay bare the error to oneself and others is retrospective discovery. It could not see the sun and sight us. In 'Unless the Eye Had Sunlike Parts' (1810), Selected Poems (1998), 107. We more readily confess to errors, mistakes, and shortcomings in our conduct than in our thought. We praise the eighteenth century for concerning itself chiefly with analysis. The task remaining to the nineteenth is to discover the false syntheses which prevail, and to analyse their contents anew. What a master a man would be in his own subject if he taught nothing useless! What a true saying it is that he who wants to deceive mankind must before all things make absurdity plausible. What friends do with us and for us is a real part of our life; for it strengthens and advances our personality. The assault of our enemies is not part of our life ; it is only part of our experience ; we throw it off and guard ourselves against it as against frost, storm, rain, hail, or any other of the external evils which may be expected to happen. What is exact about mathematics but exactness? And is not this a consequence of the inner sense of truth? In 'Sprüche in Prosa', Natur, 6, 948. Jeremy Naydler (ed. ), Goethe On Science: An Anthology of Goethe's Scientific Writings (1996), 92. Whatever Nature undertakes, she can only accomplish it in a sequence. She never makes a leap. For example she could not produce a horse if it were not preceded by all the other animals on which she ascends to the horse’s structure as if on the rungs of a ladder. Thus every one thing exists for the sake of all things and all for the sake of one; for the one is of course the all as well. Nature, despite her seeming diversity, is always a unity, a whole; and thus, when she manifests herself in any part of that whole, the rest must serve as a basis for that particular manifestation, and the latter must have a relationship to the rest of the system. Whatever you can do or dream you can, begin it. Boldness has genius, power, and magic in it. When a man sees a phenomenon before him, his thoughts often range beyond it; when he hears it only talked about, he has no thoughts at all. When I observe the luminous progress and expansion of natural science in modern times, I seem to myself like a traveller going eastwards at dawn, and gazing at the growing light with joy, but also with impatience; looking forward with longing to the advent of the full and final light, but, nevertheless, having to turn away his eyes when the sun appeared, unable to bear the splendour he had awaited with so much desire. In The Maxims and Reflections of Goethe (1906), 197-198. When the boy begins to understand that the visible point is preceded by an invisible point, that the shortest distance between two points is conceived as a straight line before it is ever drawn with the pencil on paper, he experiences a feeling of pride, of satisfaction. And justly so, for the fountain of all thought has been opened to him, the difference between the ideal and the real, potentia et actu, has become clear to him; henceforth the philosopher can reveal him nothing new, as a geometrician he has discovered the basis of all thought. In Sprüche in Reimen. Sprüche in Prosa. Ethisches (1850), Vol. 3, 214. As translated in Robert Édouard Moritz, Memorabilia Mathematica; Or, The Philomath’s Quotation-Book (1914), 67. From the original German, “Wenn der knabe zu begreifen anfängt, daß einem sichtbaren Punkte ein unsichtbarer vorhergehen müsse, daß der nächste Weg zwischen zwei Punkten schon als Linie gedacht werde, ehe sie mit dem Bleistift aufs Papier gezogen wird, so fühlt er einen gewissen Stolz, ein Behagen. Und nicht mit Unrecht; denn ihm ist die Quelle alles Denkens aufgeschlossen, Idee und Verwirklichtes, potentia et actu, ist ihm klargeworden; der Philosoph entdeckt ihm nichts Neues; dem Geometer war von seiner Seite der Grund alles Denkens aufgegangen.” The Latin phrase, “potentia et actu” means “potentiality and actuality”. When we find facts within our knowledge exhibited by some new method, or even, it may be, described in a foreign language, they receive a peculiar charm of novelty and wear a fresh air. Whether one show one's self a man of genius in science or compose a song, the only point is, whether the thought, the discovery, the deed, is living and can live on. In James Wood, Dictionary of Quotations from Ancient and Modern, English and Foreign Sources (1893), 549:41. With the growth of knowledge our ideas must from time to time be organised afresh. The change takes place usually in accordance with new maxims as they arise, but it always remains provisional. Without my attempts in natural science, I should never have learned to know mankind such as it is. In nothing else can we so closely approach pure contemplation and thought, so closely observe the errors of the senses and of the understanding, the weak and strong points of character. Fri 13 Feb 1829. Johann Peter Eckermann, Conversations with Goethe, ed. J. K. Moorhead and trans. J. Oxenford (1971), 293. [Nature] is complete, but never finished. Goethe's devil is a cultivated personage and acquainted with the modern sciences; sneers at witchcraft and the black art even while employing them, and doubts most things, nay, half disbelieves even his own existence. In James Wood, Dictionary of Quotations from Ancient and Modern, English and Foreign Sources (1893), 128:24. [Thomas Henry] Huxley, I believe, was the greatest Englishman of the Nineteenth Century—perhaps the greatest Englishman of all time. When one thinks of him, one thinks inevitably of such men as Goethe and Aristotle. For in him there was that rich, incomparable blend of intelligence and character, of colossal knowledge and high adventurousness, of instinctive honesty and indomitable courage which appears in mankind only once in a blue moon. There have been far greater scientists, even in England, but there has never been a scientist who was a greater man. 'Thomas Henry Huxley.' In the Baltimore Evening Sun (4 May 1925). Reprinted in A Second Mencken Chrestomathy: A New Selection from the Writings of America's Legendary Editor, Critic, and Wit (2006), 157. Pathology, probably more than any other branch of science, suffers from heroes and hero-worship. Rudolf Virchow has been its archangel and William Welch its John the Baptist, while Paracelsus and Cohnheim have been relegated to the roles of Lucifer and Beelzebub. … Actually, there are no heroes in Pathology—all of the great thoughts permitting advance have been borrowed from other fields, and the renaissance of pathology stems not from pathology itself but from the philosophers Kant and Goethe. Quoted from an address to a second year class, in Levin L. Waters, obituary for Harry S. N. Greene, M.D., in Yale Journal of Biology and Medicine (Feb-Apr 1971), 43:4-5, 207. [L]et us not overlook the further great fact, that not only does science underlie sculpture, painting, music, poetry, but that science is itself poetic. The current opinion that science and poetry are opposed is a delusion. ... On the contrary science opens up realms of poetry where to the unscientific all is a blank. Those engaged in scientific researches constantly show us that they realize not less vividly, but more vividly, than others, the poetry of their subjects. Whoever will dip into Hugh Miller's works on geology, or read Mr. Lewes's “Seaside Studies,” will perceive that science excites poetry rather than extinguishes it. And whoever will contemplate the life of Goethe will see that the poet and the man of science can co-exist in equal activity. Is it not, indeed, an absurd and almost a sacrilegious belief that the more a man studies Nature the less he reveres it? Think you that a drop of water, which to the vulgar eye is but a drop of water, loses anything in the eye of the physicist who knows that its elements are held together by a force which, if suddenly liberated, would produce a flash of lightning? Think you that what is carelessly looked upon by the uninitiated as a mere snow-flake, does not suggest higher associations to one who has seen through a microscope the wondrously varied and elegant forms of snow-crystals? Think you that the rounded rock marked with parallel scratches calls up as much poetry in an ignorant mind as in the mind of a geologist, who knows that over this rock a glacier slid a million years ago? The truth is, that those who have never entered upon scientific pursuits know not a tithe of the poetry by which they are surrounded. Whoever has not in youth collected plants and insects, knows not half the halo of interest which lanes and hedge-rows can assume. Whoever has not sought for fossils, has little idea of the poetical associations that surround the places where imbedded treasures were found. Whoever at the seaside has not had a microscope and aquarium, has yet to learn what the highest pleasures of the seaside are. Sad, indeed, is it to see how men occupy themselves with trivialities, and are indifferent to the grandest phenomena—care not to understand the architecture of the Heavens, but are deeply interested in some contemptible controversy about the intrigues of Mary Queen of Scots!—are learnedly critical over a Greek ode, and pass by without a glance that grand epic written by the finger of God upon the strata of the Earth! Education: Intellectual, Moral, and Physical (1889), 82-83. Being also in accord with Goethe that discoveries are made by the age and not by the individual, I should consider the instances to be exceedingly rare of men who can be said to be living before their age, and to be the repository of knowledge quite foreign to the thought of the time. The rule is that a number of persons are employed at a particular piece of work, but one being a few steps in advance of the others is able to crown the edifice with his name, or, having the ability to generalise already known facts, may become in time to be regarded as their originator. Therefore it is that one name is remembered whilst those of coequals have long been buried in obscurity. In Historical Notes on Bright's Disease, Addison's Disease, and Hodgkin's Disease', Guy's Hospital Reports (1877), 22, 259-260. Looking back … over the long and labyrinthine path which finally led to the discovery [of the quantum theory], I am vividly reminded of Goethe’s saying that men will always be making mistakes as long as they are striving after something. Read no newspapers, try to find a few friends who think as you do, read the wonderful writers of earlier times, Kant, Goethe, Lessing, and the classics of other lands, and enjoy the natural beauties of Munich’s surroundings. Make believe all the time that you are living, so to speak, on Mars among alien creatures and blot out any deeper interest in the actions of those creatures. Make friends with a few animals. Then you will become a cheerful man once more and nothing will be able to trouble you. Letter (5 Apr 1933). As quoted in Jamie Sayen, Einstein in America: The Scientist’s Conscience in the Age of Hitler and Hiroshima (1985), 12. This is part of Einstein’s reply to a letter from a troubled, unemployed musician, presumably living in Munich. In Probability, Statistics, and Truth (1939), 1. 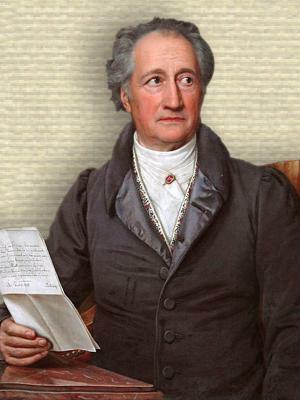 28 Aug - short biography, births, deaths and events on date of Goethe's birth. Goethe's Way of Science, by David Seamon. - book suggestion.